Tatham Colliery, or School Colliery, worked the 22-36 inch Smear Hall Coal which is interbedded with sandstones of the Ward’s Stone Sandstone (fig. 1).1 The coal is not currently exposed anywhere but there is a small outcrop of those sandstones in Park Gill and this is probably where coal was first found, as the geological survey of the 1880s recorded coal debris here.8 Above lie, in turn, the soft Caton Shales and the siltstones and sandstones of the Claughton Formation, whilst below are the siltstones and sandstones of the Roeburndale Formation, all extensively covered with superficial deposits of glacial till. The regional dip of the bedrock is NE at moderate angles. 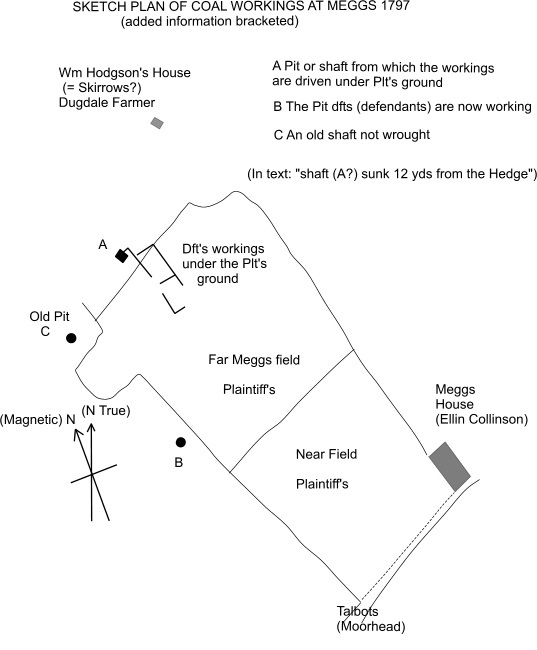 The coalfield extent is limited to the east by a boundary fault which drops (downthrows) the coal down at least 80 m.
The document records the discovery of the coal about 1781 by the lessees and gives a rough plan showing three pits (shafts) close to Meggs with workings extending under one of her fields (fig. 2). These were driven by John Cornthwaite for the company, and comprised levels of 30 ft and upwards (also said to be 44 ft) with 5 ft width. The amount of coal removed was assessed by a miner, John Wilson, (presumably engaged for the case) as being 444 loads obtained at a cost of 2½-3d each and sold for 6-7d. These shafts must have been 50 yds deep and the site would have been identified by boring. The 1852 mine plan and an associated cross-section were produced by J(ohn) Kelly, colliery surveyor, for Pudsey Dawson of Hornby Castle Estate. The 1851 census shows that when working on the mine survey he was 29 years old, born in Dublin, and boarded at William Cornthwaite’s Bridge House Farm, Wray3 whilst working on the mine survey. The original plan and section are large, at a scale of 1:720, but reduced, edited and redrawn versions are presented here (they include all the original information with additional material in brackets) (figs. 3 & 4). Click here for an example of the original plan. The plan shows the extent of coal mining by the estate’s Tatham School Colliery, as it is called here, and includes most of the pits shown in fig. 1. The Old Works shown may include other operators’ works. It also gives the surveyor’s recommendations for the future development of the mine. The survey will have been conducted with a chain of 22 yards length and a miner’s dial (compass / clinometer). The compass directions given on the map are the measured ones relative to magnetic north, which differed substantially from true north as the declination (variation) was then about 20° W (now less than 4°W).9 They are quoted relative to N-E, but as they are not north-east the meaning of E is unknown. (There is a typographical error on the original plan: the first length of the New Level should be 23 yds not 123 yds). A single measured value of the coal dip gives 1 in 4.5 (12.5 o) at 67 o N (True). Twenty-seven pits (shafts) are recorded on the plan, varying in depth from 11 - 68 yds. New shafts were required when underground haulage lengths became inefficiently long and also when new areas were tapped, e.g. when the worked coal died out against a fault. Also shown are 10 faults (hitches), with downthrows of 4 - 19 yds reported, which subdivide the colliery into ten sections (A-J). The plan shows levels driven at low angles of slope, i.e. approximately at right angles to the dip of the coal (strike), which acted as the haulage (drawing) road to bring coal to the pit bottom and as a route for ground water draining to a sump at the pit base. From these, coal extraction proceeded in an up dip (rise) direction from a level using a pillar and stall (board) system, i.e. with a worked out stall (goaf) separated by pillars of coal left to support the roof and minimise subsidence. The stall, and working face at its head, was recorded as 5 ft wide in 1781.6 However, the triangle ornament drawn on the plan (click here to view an extract) along the sides of the levels suggests that contemporary pillar and stall widths were 15 ft, if drawn to scale. Furthermore, in the area under Moorhead, the plan suggests the thick pillars along the levels became replaced by narrow ribs about 4 ft wide. (Such a system has been used in mines elsewhere).10 The apparent absence of ribs on the plan elsewhere may indicate final mining of the pillars, or it may just be a simplification. The coal would be mined by the hewer, lying on a shoulder, and then thrown to the side into higher passages (gates). These were driven at regular intervals up the rise between the levels, with the coal at roof height.10 The hewn coal was then hauled to the shaft in a wicker basket (corf / corves) on a sledge, often by boys. The corves were raised to the surface by hand-operated windlass (shafts less than 10 m) or a horse drawn gin or a steam engine. Surplus rock from the gates and face would be thrown into the goaf. Additional support for the roof would be provided by the wooden props supplied by the estate. Further parallel levels were constructed in some areas as coal extraction proceeded, connected to the lowest by inclined drawing roads. It is clear that ground water was a major problem in the colliery. In the earliest years it would have been drawn up the shaft in buckets but eventually one or more drainage levels (soughs) were dug. The 1852 plan shows the existence of the Wenning Level running roughly north westerly for 200 yds from the base of the 68 yds deep Getting Pit, which had its base at about 35 m altitude (OD). The probable outlet for this has been located near Tatham Bridge where the river level is below 39 m altitude on the OS map. It is a 0.8 x 1.1 m (approx. 1 x 1¼ yd) stone lined culvert with running water and a floor coated with precipitated iron oxide, typical of mine drainage (fig 5). As such, it puts the overall length from the Getting Pit as about 960 yds (880 m). 1819 Saturday November 6th. I went to Tatham Coal Pit the Men had finished the length of level(,) directed the men where to get stones for walling it. 1829 Friday October 16th. I went to Tatham Bridge with J Thistlethwaite, G M Williamson and Thomas Charnley of Hornby to try to open the level at Tatham Colliery which was stopped but the day proved wet the water came out and stopped us. The drainage level was not designed for coal haulage and would be as small as feasible, little more than the dimensions of the present outlet, which was built by the North Western Railway when realigning the river in 1848. However, Smith’s record of completion after only seven months implies a rapid digging rate of about 6 yds per day and it may only have been a section of it. In comparison, a sough at Ingleton Coalfield 700 yds long took a yard per day in 1828.14 Surprisingly there is no evidence of spoil from its excavation but it may have been used as fill for the railway and new road embankments. The identification on the plan of sections of a Park Gill Level, connected by a production level (area F), is interpreted as an earlier drainage level with an outlet in Park Gill at about 60 m altitude, although presumably now blocked as there is no sign of mine water discharge. 1825 Wednesday May 17th. I went to the Engine House at Tatham where we broke up 42 cwt of old cast iron for some potters. 1825 Wednesday May 24th. James Stephenson fetched the boiler of the steam engine at Tatham to Hornby on his wagon. 1833 Friday September 20th. I went to Tatham Colliery to see about repairing the Cinder Ovens. 1836 Wednesday December 14th. I went to Tatham about getting cinders burning for Wennington Mill. I agreed with John Wildman to burn them and Aaron Burrow to lead them the coals from W Halls pit. The extension of the Wenning Level to the SE across the coalfield was a key element in Kelly’s advice for its development. 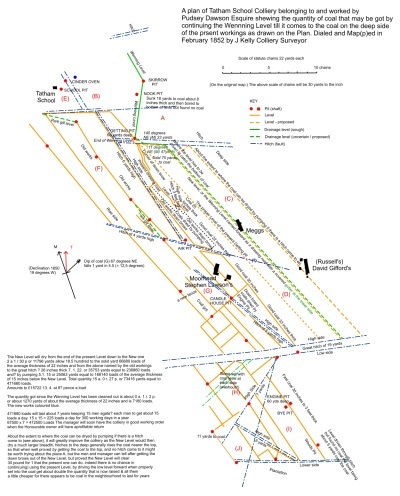 It would have an initial section of 70 yds in the down dip direction to where it would intersect the dipping coal seam and then run along its strike. As he foresaw it there would be a gutter along the side of a projected haulage road. On the plan the latter section is continued across the 4 yds fault which would put the sough 4 yds below the coal. 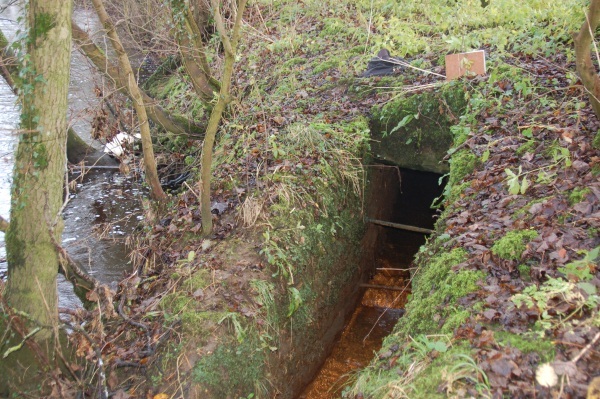 To drain that sector the sough would either have to be connected by an underground shaft (staple pit), or boreholes up to the seam or be diverted further down dip. Another element of his advice was to continue the proper level of the present pit to the Great Hitch (i.e. drained by existing Wenning Level). A third element was the possible further increase to be gained by pumping. Strangely, in calculating the additional coal reserves gained by these three steps he allows for the reduced effect due to the 4 yds fault in the first case but not the other two. He calculates these reserves as equivalent to 472 000 loads, which equates to 47 000 tons of coal. In converting the mineable areas into loads, i.e. from reserves into yield, Kelly assumed an optimistic coal recovery rate of 100 %. Furthermore, his estimate of a seven year life was based on fifteen hewers, which with pullers, hoisters and banksmen would add up to an unusually large workforce for a small coalfield. For comparison, the total of all coal miners in Tatham and Melling parishes in the decade from 1841, working in four main and possibly several smaller local collieries, was 47.15,16 About 10% of these were boys under 17. 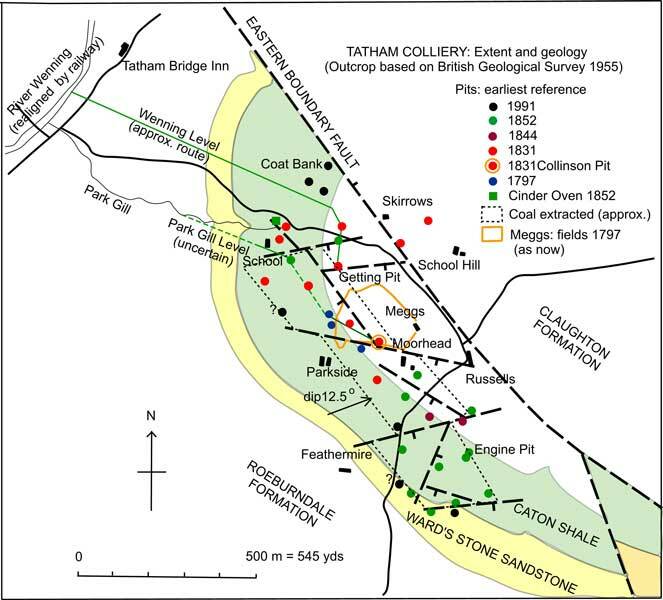 Little is known about the history of the colliery in this later period but the lack of evidence for new pits in the Meggs area suggests that non of these recommendations was ever carried out. The limited indications of post-1852 mining suggested by later maps (fig. 1), includes a new venture on Coat Bank which, with 3 pits, presumably was productive despite the lack of coal noted in 1852 in Nook Pit at the foot of the hill. In addition there was some extension of earlier works in the south. Fig. 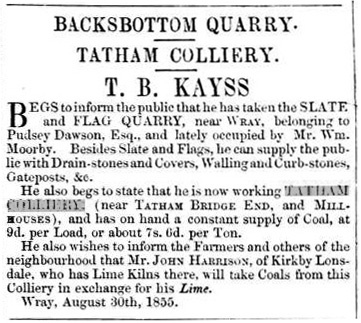 6 Advert for coal sales from Tatham Colliery, Lancaster Gazette 1855. It is estimated here that the total coal extracted by 1852 was about 100,000 tons (fig. 1), assuming the coal thickness varied from 22 ins in the north to 30 ins in the south. Regrettably, very little evidence of this small but locally important colliery exists today (only four pits), due to recent levelling of the pit remains for agricultural reasons. 1 British Geological Survey 1995: Lancaster Sheet 59 1:50 000 Series. 2 Diary of George Smith, Tatham 1819-1856, transcribed by Jennifer Holt (Privately held). 3 Tatham Tithe Apportionment 1848: Lancashire Record Office. 4 Hudson, PJ 1998: Coal mining in Lunesdale. Hudson History of Settle, 303 pp. 5 Tatham Land Taxes 1781-1832: Lancashire Record Office. 7 Hudson, PJ 2001-2: Coal seams and mine workings below Moorhead and Meggs Farm. Contrebis 26, 38-40. 8 Geological Survey of England & Wales 1884: Sheet 91 NE Lancaster. 10 M. Gill 2012: pers. comm. 11 Kelly, M 2008: Geology of the Lune and upper Ribble coalfields. British Mining, 85, 83 pp. 12 D Kenyon 2010: pers. comm. 13 Tyson, LO 2007: Mashamshire collieries. British Mining, 82, 159 pp. 14 Sergeantson GJ 1844: Ingleton Colliery Notes, Northern Mines Research Society records, unpublished. 21 Stukeley, W 1883: A glossary of terms used in coal mining. E & FN Spon, London, 296 pp.